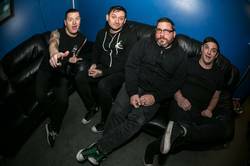 Fat Wreck Chords has announced Stay Rad, the eigth full-length from Teenage Bottlerocket, set for official release on March 15. The new records was recorded at The Blasting Room in Fort Collins, CO, produced by longtime collaborator Andrew Berlin, and mixed by Jason Livermore. The new tune "I Wanna Be A Dog" is online at Spotify now. The band also has several North American and European dates scheduled for the coming year, posted below.